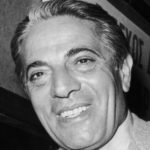 Aristotle Onassis commonly called Ari or Aristo Onassis, was a Greek shipping magnate who amassed the world’s largest privately owned shipping fleet and was one of the world’s richest and most famous men. He was known for his business success, his great wealth and also his personal life, including his marriage to Athina Mary Livanos his affair with famous opera singer Maria Callas; and his 1968 marriage to Jacqueline Kennedy, the widow of American President John F. Kennedy. "To succeed in business it is necessary to make others see things as you see them."